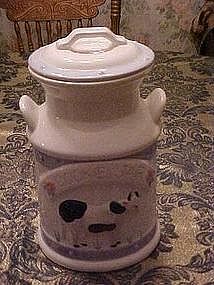 Nice hand painted glazed ceramic cookie jar is in the shape of an old milk can. It has a raised relief design of a spotted cow and hand painted decoration of an arch over the cow that says COOKIE JAR and is decorated with roses on each end and other hand painted accents. Measures 11" tall and is in perfect condition.